Easily increase moisture levels in your home with this Powered Flow-Through Whole House Humidifier from Honeywell. Designed for homes from 2700 sq. ft. to 4500 sq. ft., it mounts directly to your furnace and distributes moisture through a central HVAC system. Its flow-through design keeps the unit clean and lowers the frequency of maintenance and covers more cubic volume to replenish residential moisture levels with minimal upkeep. The PerfectFLO distribution tray optimizes efficiency and water usage to save money on heating and cooling bills. For gas furnaces and 30 millivolt systems. Includes adapter fittings with heavy, long-lasting element. Universal adapter fits screw-in, clamp-on or push-in type pilot burners. It has positive positioning for quick insertion. The Honeywell 3.0 Gallon Console Humidifier has manual, easy-to-use controls and has QuietCare Technology which is 30 percent quieter for ultra quiet performance. Air Washing Technology features a pre-filter to help capture dust, dirt and pollen from the air. It has a 3 gallon capacity with a 9 gallon output per day. Adjustable humidistat. Powered Flow-Through Whole House Humidifier Easily increase moisture levels in your home with this Powered Flow-Through Whole House Humidifier from Honeywell. Designed for homes from 2700 sq. ft. to 4500 sq. 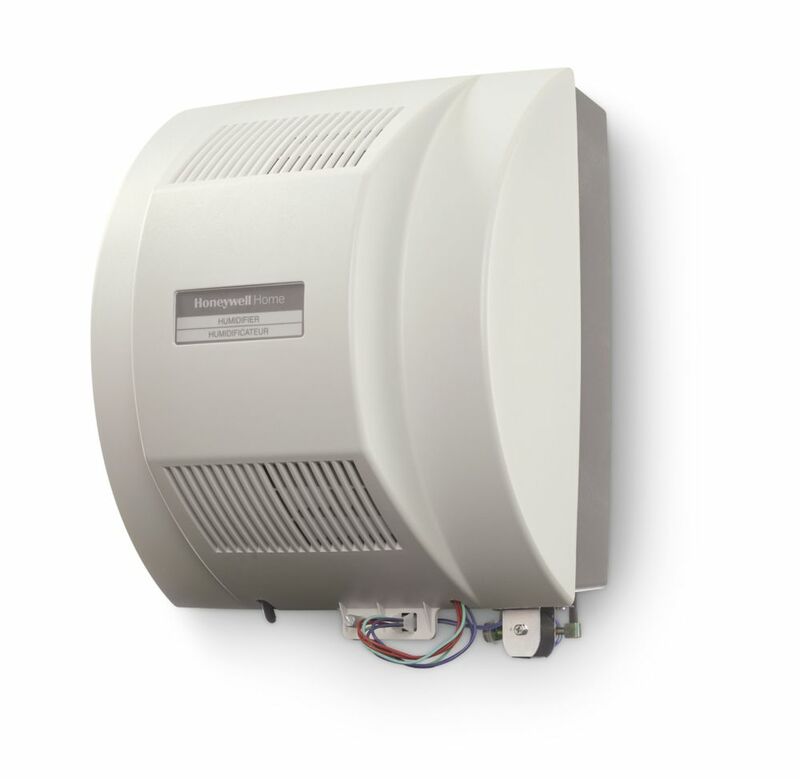 ft., it mounts directly to your furnace and distributes moisture through a central HVAC system. Its flow-through design keeps the unit clean and lowers the frequency of maintenance and covers more cubic volume to replenish residential moisture levels with minimal upkeep. The PerfectFLO distribution tray optimizes efficiency and water usage to save money on heating and cooling bills. Powered Flow-Through Whole House Humidifier is rated 2.2 out of 5 by 6. Rated 1 out of 5 by timw from Not good quality I have had a lennox whole home humidifier at my previous home and it humidified very effectively from the day it was installed. I bought this honeywell expecting similar results and it has been very disappointing. The first one the fan broke off and shredded the inside of the humidifier so I returned it, the second one had wires that were clamped in the unit in the box so it never worked, third time was effective but the humidifier does not add humidity well at all. The fan is not strong enough to form any type of suction at the vents so there is neutral air sitting by the humdifier pad and very little going into our supply duct. It does not seem to be adding more than 2-3% to our home versus when it is off. Rated 1 out of 5 by Alexhei from Solenoid problem This unit never worked properly for very long. Furnace would start in the middle of the night and you would hear the solenoid clicking on and off constantly. Honeywell would not send another solenoid. Just said to bring it back to Home Depot. Rated 1 out of 5 by Carm from faulty compression fitting Product was fairly easy to install. My wiring was a bit more complicated as I had it hooked up to my ecobee3 but still pretty straight forward. Everything went together easy.. I followed the instructions to the letter. The product lasted 3months before the water tube to the unit separated from the valve and sprayed water all down the side of my furnace and into my floor drain for hours before I woke up. The sleeve provided with the compression fitting is what I believe to be the culprit. It slid in and out of the tube too freely. Purchasing a new sleeve I noticed that once inserted into the water tube, it cannot be pulled out. So once the compression nut gets tightened the ferrule (facing the right direction) deforms and makes a tight seal (What I thought I had the first time) but since the original sleeve was undersized it didn't make the most secured seal. Luckily i didn't have any flooding or damage to my furnace. But a real eye opener. How does something like that slip past QA? Rated 5 out of 5 by AllistonOntario from Easy to install, quiet unit Purchased this unit over the drum type which gets messy with gunk fairly quickly. This unit requires far less maintenance and quieter than the furnace. It was easy to install, cutting the holes were easy if you know how and had it up and running in a couple hours. Unit has worked well and resolved the lack of humidity in our new home. The only sad part is the saddle clamp which is not recommended for tapping into pipes any day. A Proper tee and value would be a far better approach which since most homes are plumbed with PEX, Sharkbit quick connects have what you need and a better choice. Rated 4 out of 5 by Neanderthalman from Excellent Performance Runs quieter than the furnace, easy to install. Unsure why other reviewer claimed it was loud - resonance problem? It *is* a fan screwed to a tin box. Not terribly happy with the pressure switch and wiring. Sure, 24V doesn't *need* be covered, but for a unit that looks as good as this, at least a cover to hide terminations would finish it off. You'll also want to use foil tape around the humidifier unit - there's no gasket material to seal against the plenum. I read a review online of someone mentioning the humidifier comes with a digital thermostat, and it connects to a weather sensor to be installed on the outside. Is that actually the case? Hi Jakub! The Honeywell Powered Flow-Through Whole House Humidifier does come with H8908 Humidistat, this is not a digital unit, and does not include an outdoor weather sensor. Please feel free to contact Honeywell Technical Support at (800) 468-1502 for any questions regarding this product. Thank you.